This card was ranked #3 on my Top Ten list. My favorite dinosaur has always been the Tyrannosaurus Rex. As a young child, I was captivated mainly by the animal’s size and gigantic sharp teeth, and I suppose that hasn’t really changed that much over time. It’s sort of the real-world equivalent of Godzilla, except that we know that it actually existed. I was very happy that it’s also one of the most purely powerful dinosaurs in Ixalan. Not in the sense that you simply put it in every tribal deck and let it do its thing; even with ramp spells from older sets, it can be risky to rely on it against very fast decks, but it is devastating against control decks, where it punishes people for thinking it’s safe to cast Wrath of God and demands they do so if they haven’t. This card was ranked #11 on my Top Ten list. Open the door, get on the floor, everyone do the dinosaur. I had to do a double take when I first saw this card. Nothing fancy here, just good stats on top of good abilities. This card is a great finisher especially if its following a “Regisaur Alpha”. This guy demolishes “Burning Sun’s Avatar” as the go-to 6 drop dino. I’m surprised we aren’t seeing more Carnage Tyrants in top play as he is safe from a lot of control and can safely trade with gods. Just be careful of Deathtouch. This card was unranked on my Top 10 list. Turns out that giant, implacable death lizards are usually the correct option. 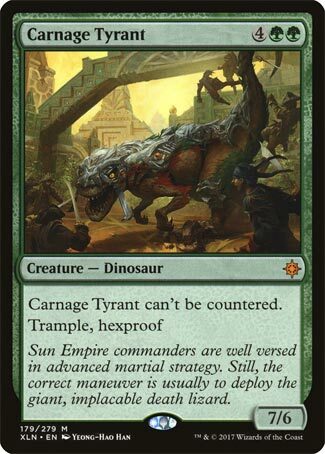 Carnage Tyrant is ruthlessly efficient and very blunt: a hard-to-kill death lizard that will damage something. Hexproof makes it even harder to remove (especially alongside that nice 6 toughness), and being uncounterable makes blue quite sad. It’s the go-to beatstick of choice in Ixalan Standard, and it represents an immediate threat with few answers.